Archduke Charles (baptized Carolus Franciscus Josephus Wenceslaus Balthasar Johannes Antonius Ignatius), the second son of the Emperor Leopold I and of his third wife, Princess Eleonor Magdalene of Neuburg, was born on 1 October 1685. His tutor was Anton Florian, Prince of Liechtenstein. Following the death of Charles II of Spain, in 1700, without any direct heir, Charles declared himself King of Spain—both were members of the House of Habsburg. The ensuing War of the Spanish Succession, which pitted France's candidate, Philip, Duke of Anjou, Louis XIV of France's grandson, against Austria's Charles, lasted for almost 14 years. The Kingdom of Portugal, Kingdom of England, Scotland, Ireland and the majority of the Holy Roman Empire endorsed Charles's candidature. Charles III, as he was known, disembarked in his kingdom in 1705, and stayed there for six years, only being able to exercise his rule in Catalonia, until the death of his brother, Joseph I, Holy Roman Emperor; he returned to Vienna to assume the imperial crown. Not wanting to see Austria and Spain in personal union again, the new Kingdom of Great Britain withdrew its support from the Austrian coalition, and the war culminated with the Treaties of Utrecht and Rastatt three years later. The former, ratified in 1713, recognised Philip as King of Spain; however, the Kingdom of Naples, the Duchy of Milan, the Austrian Netherlands and the Kingdom of Sardinia – all previously possessions of the Spanish—were ceded to Austria. To prevent a union of Spain and France, Philip was forced to renounce his right to succeed his grandfather's throne. Charles was extremely discontented at the loss of Spain, and as a result, he mimicked the staid Spanish Habsburg court ceremonial, adopting the dress of a Spanish monarch, which, according to British historian Edward Crankshaw, consisted of "a black doublet and hose, black shoes and scarlet stockings". Charles's father and his advisors went about arranging a marriage for him. Their eyes fell upon Elisabeth Christine of Brunswick-Wolfenbüttel, the eldest child of Louis Rudolph, Duke of Brunswick-Wolfenbüttel. She was held to be strikingly beautiful by her contemporaries. On 1 August 1708, in Barcelona, Charles married her by proxy. She gave him two daughters that survived to adulthood, Maria Theresa and Maria Anna. 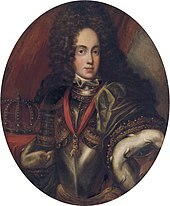 When Charles succeeded his brother in 1711, he was the last male Habsburg heir in the direct line. Since Habsburg possessions were subject to Salic law, barring women from inheriting in their own right, his own lack of a male heir meant they would be divided on his death. The Pragmatic Sanction of 19 April 1713 abolished male-only succession in all Habsburg realms and declared their lands indivisible, although Hungary only approved it in 1723. Charles had three daughters, Maria Theresa (1717-1780), Maria Anna (1718-1744) and Maria Amalia (1724-1730) but no surviving sons. When Maria Theresa was born, he disinherited his nieces and the daughters of his elder brother Joseph, Maria Josepha and Maria Amalia. It was this act that undermined the chances of a smooth succession and obliged Charles to spend the rest of his reign seeking to ensure enforcement of the Sanction from other European powers. They exacted harsh terms; in 1731, Charles agreed to a demand from Britain that he close a trade competitor, the Ostend Company, which was based in the Austrian Netherlands and that he himself founded in 1722. However, by 1735 he had secured approvals from key states, most importantly the Imperial Diet, which in theory bound all its members including Prussia and Bavaria. Other signatories included Britain, France, the Dutch Republic, Spain, Russia, Denmark and Savoy-Sardinia but subsequent events underlined Eugene of Savoy's comment that the best guarantee was a powerful army and full Treasury. His nieces were married to the rulers of Saxony and Bavaria, both of whom ultimately refused to be bound by the decision of the Imperial Diet and despite publicly agreeing to the Pragmatic Sanction in 1735, France signed a secret treaty with Bavaria in 1738 promising to back the 'just claims' of Charles Albert of Bavaria. In the first part of his reign, Austrian continued to expand; was successful in the Austro-Turkish War (1716–1718), adding Banat to Hungary, and establishing direct Austrian rule over Serbia and Oltenia (Lesser Wallachia). This extended Austrian rule to the lower Danube. The War of the Quadruple Alliance (1718-1720) followed. It too ended in an Austrian victory; by the Treaty of The Hague (1720), Charles swapped Sardinia, which went to the Duke of Savoy, Victor Amadeus, for Sicily, the largest island in the Mediterranean, which was harder to defend than Sardinia. The treaty also recognised Philip V of Spain's younger son, Don Carlos (the future Charles III of Spain), as heir to the Duchy of Parma and Grand Duchy of Tuscany; Charles had previously endorsed the succession of the incumbent Grand Duke's daughter, Anna Maria Luisa, Electress Palatine. Peace in Europe was shattered by the War of the Polish Succession (1733–1738), a dispute over the throne of Poland between Augustus of Saxony, the previous King's elder son, and Stanisław Leszczyński. Austria supported the former, France the latter; thus, a war broke out. By the Treaty of Vienna (1738), Augustus ascended the throne, but Charles had to give the Kingdom of Naples to Don Carlos, in exchange for the much smaller Duchy of Parma. The issue of Charles' elder daughter's marriage was raised early in her childhood. She was first betrothed to Léopold Clément of Lorraine, who was supposed to come to Vienna and meet Maria Theresa. Instead, he died of smallpox in 1723, which upset Maria Theresa. Léopold Clément's younger brother, Francis Stephen, then came to Vienna to replace him. Charles considered other possibilities (such as Don Carlos) before announcing the engagement to Francis. At the end of the War of the Polish Succession, France demanded that Francis surrender the Duchy of Lorraine (his hereditary domain), to Stanisław Leszczyński, the deposed King of Poland, who would bequeath it to France at his death. Charles compelled Francis to renounce his rights to Lorraine and told him: "No renunciation, no archduchess." Francis complied; he was married to Maria Theresa in February 1736, and Lorraine devolved to Stanisław in July 1737. In 1737, the Emperor embarked on another Turkish War in alliance with Russia. Unlike the previous Austro-Turkish War, it ended in a decisive Austrian defeat. Much of the territory gained in 1718 (Except for the Banat) was lost. Popular discontent at the costly war reigned in Vienna; Francis of Lorraine, Maria Theresa's husband, was dubbed a French spy by the Viennese. The war not only revealed the sorry state of the Austrian army, but also the weakness of the imperial state itself, which did not have the financial strength to sustain a long war without the subsidies of its allies. At the time of Charles' death, the Habsburg lands were saturated in debt; the exchequer contained a mere 100,000 florins; and desertion was rife in Austria's sporadic army, spread across the Empire in small, ineffective barracks. Contemporaries expected that Austria-Hungary would wrench itself from the Habsburg yoke upon his death. The Emperor, after a hunting trip across the Hungarian border in "a typical day in the wettest and coldest October in memory", fell seriously ill at the Favorita Palace, Vienna, and he died on 20 October 1740 in the Hofburg. In his Memoirs Voltaire wrote that Charles' death was caused by consuming a meal of death cap mushrooms. Charles' life opus, the Pragmatic Sanction, was ultimately in vain. Maria Theresa was forced to resort to arms to defend her inheritance from the coalition of Prussia, Bavaria, France, Spain, Saxony and Poland—all party to the sanction—who assaulted the Austrian frontier weeks after her father's death. During the ensuing War of the Austrian Succession, Maria Theresa saved her crown and most of her territory but lost the mineral-rich Duchy of Silesia to Prussia and the Duchy of Parma to Spain. Emperor Charles VI has been the main motif of many collectors' coins and medals. One of the most recent samples is high value collectors' coin the Austrian Göttweig Abbey commemorative coin, minted on 11 October 2006. His portrait can be seen in the foreground of the reverse of the coin. 4 November 1716 Archduke of Austria, died aged seven months. 29 November 1780 Archduchess of Austria and heiress of the Habsburg dynasty, married Francis III Stephen, Duke of Lorraine (later Francis I, Holy Roman Emperor) and had issue; succeeded by the House of Habsburg-Lorraine. 16 December 1744 Archduchess of Austria, married Prince Charles Alexander of Lorraine, with whom she served as Governess of the Austrian Netherlands. Died in childbirth. 19 April 1730 Archduchess of Austria, died aged six. Full titles of Charles as the emperor and ruler of Habsburg lands as well as a pretender to the Spanish throne went as follows: Charles, by the grace of God elected Holy Roman Emperor, forever August, King in Germany, of Castile, Aragon, Leon, both Sicilies, Jerusalem, Hungary, Bohemia, Dalmatia, Croatia, Slavonia, Rama, Serbia, Galitia, Lodomeria, Cumania, Bulgaria, Navarre, Grenada, Toledo, Valencia, Galicia, Majorca, Sevilla, Sardinia, Cordova, Corsica, Murcia, Jaen, the Algarve, Algeciras, Gibraltar, the Canary Islands, the islands of India and Mainland of the Ocean Sea, Archduke of Austria, Duke of Burgundy, Milan, Brabant, Lorraine, Styria, Carinthia, Carniola, Limburg, Luxemburg, Gelderland, Württemberg, the Upper and Lower Silesia, Calabria, Athens and Neopatria, Prince of Swabia, Catalonia, Asturia, Margrave of the Holy Roman Empire, of Burgau, Moravia, the Upper and Lower Lusatia; Count Palatine of Burgundy, Princely Count of Habsburg, Flanders, Tyrol, Ferrette, Kyburg, Gorizia, Artois, Landgrave of Alsace, Margrave of Oristano, Count of Goceano, Hainaut, Namur, Roussillon, Cerdagne, Lord of the Windic March, Pordenone, Biscay, Molina, Salins, Tripoli and Mechelen, etc. ^ Crankshaw, Edward, Maria Theresa, 1969, Longman publishers, Great Britain (pre-dates ISBN), 24. ^ a b c d e Pragmatic Sanction of Emperor Charles VI, Encyclopædia Britannica, retrieved 15 October 2009. ^ a b Encyclopædia Britannica. "Charles VI (Holy Roman emperor)". britannica.com. Retrieved 22 October 2009. ^ Fraser, Antonia: Love and Louis XIV: The Women in the Life of The Sun King, Orion books, London, 2006, ISBN 978-0-7538-2293-7, 331. ^ a b Crankshaw, 9. ^ Holborn, Hajo: A History of Modern Germany: 1648–1840 Princeton University Press 1982 ISBN 0-691-00796-9, 108. ^ Encyclopædia Britannica. "Ostend Company". britannica.com. Retrieved 23 October 2009. ^ Black, James (1999). From Louis XIV to Napoleon: The Fate of a Great Power. Routledge. p. 82. ISBN 185728934X. ^ Kahn, Robert A.: A History of the Habsburg Empire, 1526–1918, University of California Press, California, 1992, ISBN 978-0-520-04206-3, 91. ^ Acton, Harold: The Last Medici, Macmillan, London, 1980, ISBN 0-333-29315-0, p. 256. ^ Encyclopædia Britannica. "War of the Polish Succession (European history)". britannica.com. Retrieved 23 October 2009. ^ a b Crankshaw, 33. ^ Edward Crankshaw: Maria Theresa, A&C Black, 2011. And also: «[...] after a day of hunting, the emperor fell ill with a cold and fever. Upon his return to his hunting lodge, Charles requested his cook to prepare him his favorite dish of mushrooms. Soon after eating them, he fell violently ill. His physicians bled him but to no avail» (Julia P. Gelardi: In Triumph's Wake: Royal Mothers, Tragic Daughters, and the Price They Paid for Glory, Macmillan, 2009). ^ In the first days of October 1740, in a cold day of pouring rain Emperor Charles VI, «in spite of the warnings of his physicians» (Eliakim Littell, Robert S. Littell: Littell's Living Age, Volume 183, T.H. Carter & Company, 1889, pg. 69), went to hunting ducks on the shores of Lake Neusiedl, close to the Hungarian border and he had come back chilled and soaked through to his little country palace at La Favorita; on his return, though he was feverish and suffering from colic, the Emperor persisted in eating one of his favourite dishes, a Catalan mushroom stew («a large dish of fried mushrooms» for the Littell brothers), prepared by his cook. He spent the night between 10 and 11 October vomiting. The following morning he was gravely ill, brought down by a high fever. Carried slowly to Vienna in a padded carriage, he died in the Hofburg nine days after. ^ «Charles the Sixth died, in the month of October 1740, of an indigestion, occasioned by eating champignons, which brought on an apoplexy, and this plate of champignons changed the destiny of Europe» (Voltaire: Memoirs of the Life of Voltaire, 1784; pp. 48–49). ^ Wasson RG. (1972). The death of Claudius, or mushrooms for murderers. Botanical Museum Leaflets, Harvard University 23(3):101–128. ^ Browning, Reed: The War of the Austrian Succession, Palgrave Macmillan, 1995, ISBN 0-312-12561-5, 362. ^ "Nonnberg Abbey coin". Austrian Mint. Archived from the original on 24 September 2010. Retrieved 7 July 2008. ^ a b Crawley, Charles (16 November 2017). "AUSTRIA". Medieval Lands (3rd ed.). Retrieved 17 April 2018 – via Foundation for Medieval Genealogy. ^ a b c d Genealogie ascendante jusqu'au quatrieme degre inclusivement de tous les Rois et Princes de maisons souveraines de l'Europe actuellement vivans [Genealogy up to the fourth degree inclusive of all the Kings and Princes of sovereign houses of Europe currently living] (in French). Bourdeaux: Frederic Guillaume Birnstiel. 1768. p. 100. ^ a b Louda, Jirí; MacLagan, Michael (1999). Lines of Succession: Heraldry of the Royal Families of Europe (2nd ed.). London: Little, Brown and Company. table 84.